The Aesthetic Era of the 19th century, or Aesthetic Movement, as it is often referred to, produced exquisite silver objects, some of them arguably among the most beautiful silver objects ever made. These pieces are highly prized by collectors of both sterling and silver plate. There are certain identifiable characteristics and qualities that distinguish Aesthetic Era antique silver plate from silver of other periods, and from contemporary reproductions. Identify the era. 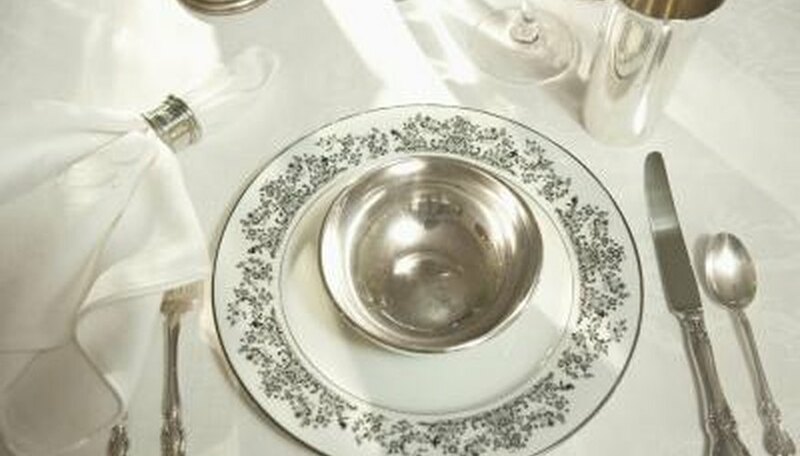 The Aesthetic Era of silver plate runs roughly from the mid-1800s to the turn of the 20th century. Japan had opened up to the West, and the Oriental influence became the rage in decorative objects. Look for figural silver. The most highly prized pieces of Aesthetic Era silver plate will have figures on them. These are basically three-dimensional miniature statues that grace the silver objects. Some have glass eyes, some are partially gilded. All are exquisitely crafted, showing details like the individual hairs of a dog, the shafts of a bird's feathers, or the veins in a leaf. Modern era reproductions usually don't have this fine detail and are more crudely made. Look for a satin finish. Many antique silver plate pieces from the Aesthetic Era have what is called a satin finish. The silver has a soft, textured appearance. Usually, the decorative cut engraving is in shiny bright silver that stands out against the satiny surfaces. Find naturalistic themes. Antique silver plate from this era is dominated by themes from nature. Birds, animals, insects and plants are beautifully rendered in silver. Sometimes the artwork is executed in embossed designs, called repoussé, sometimes in cut engraving, and sometimes in applied silver decorations. Search for tall legs. Many makers of antique silver plate from the era favored lifting their pieces up on tall decorative legs. Many times, the legs were figural, bearing the heads of lions, Greek gods, or maidens. This gave the pieces an imposing and grand appearance. Hunt for quadruple or triple plate. Antique silver plate from this era is most commonly marked with the words, "Quadruple Plate." This means there are four layers of silver plate on the piece. The term "Triple Plate" is sometimes seen as well. These terms were rarely used after about 1900. If you have a piece that says "Quadruple Plate," it likely is very old. Learn the Aesthetic Era makers of silver plate. Among the top names to look for in collectible antique silver plate from the era are Meriden B Company, James W. Tufts, Wilcox, Derby, Gorham, and Reed & Barton. These companies thrived from about the mid-1800s up until 1898. The silver industry was booming and demand was so high that most of the companies banded together to form one large company, International Silver Company, which is still a going concern. After 1898, some pieces carry both names: the original company mark and International Silver, or just IS. After 1900, most of the former names ceased to be used. Antique silver plate that has lost it's silver will have a dull appearance. If a piece has been re-plated, the details will be lost by silver pooling in the crevices, and the finish will sometimes be flaky. A piece may be black with tarnish, but if it still has a sheen to it, the silver is still there.